GP Bullhound office in London wanted a reliable and unobtrusive microphone to enhance the video conferencing experience while complementing their exclusive office furniture. Sennheiser TeamConnect Ceiling microphone was flush-mounted in the boardroom ceiling, making it almost invisible. Its 29 microphone capsules and the world’s first automatic beamforming technology enhanced the audio quality for video conferences. Investment bank GP Bullhound has a central conference room in which the audio and video conference system has no visible microphones. This globally active investment firm has installed TeamConnect Ceiling microphones in its boardroom. Sennheiser's new product offers several advantages: each participant is fully intelligible, there are no cables cluttering up the conference table and the room's aesthetics are not impaired. Profile GP Bullhound is a technology investment bank headquartered in Jeremyn Street, London, just a few blocks away from Buckingham Palace and has six offices spread across Europe and the US. They provide high value, independent strategic advice on Mergers & Acquisitions and Capital raising to leading technology entrepreneurs, companies and investors across the globe. Incredible growth: established in 1999, investment bank GP Bullhound has gained many accolades in just a short time. In 2015 for example they received the Best M&A Boutique Investment Bank of the Year award. GP Bullhound focuses on bringing together new technology entrepreneurs and investors from all corners of the globe. Official motto: "Deal makers in technology". The company is based in modern offices in Tech City/East London, Great Britain's centre for technology firms and start-ups. The company's perfect office infrastructure did have one snag, however. The video and audio conferences organised in the central boardroom at head office in London repeatedly had intelligibility problems with its external participants around the world. People simply couldn't hear properly. "The microphones didn't do what they were supposed to do, the existing technology had reached its limits", recalls Dave Nish, GP Bullhound's technology manager responsible for all six offices in the USA and Europe. 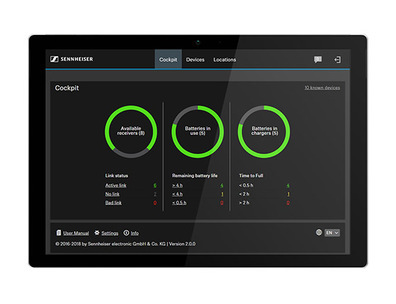 In his search for a solution to his audio problem, the IT manager soon hit on Sennheiser, initially considering the TeamConnect Wireless conference solution. It quickly became apparent that the requirements in the London office would be better solved by the TeamConnect Ceiling microphone system. TeamConnect Ceiling has 29 individual, omnidirectional microphone capsules installed in an aesthetically pleasing ceiling unit which can be fitted to an existing ceiling either flushmounted or suspended. The microphone capsules, produced in Germany, seek out and align with the loudest speaker at any one time and actually follow him/her around the room (Beamforming technology). The big advantage of this Sennheiser solution is that the microphone automatically tracks the speaker, it is not necessary to preset the effective range. Dave Nish also liked the fact that TeamConnect solution completely frees the conference table of cables and other equipment. A central processing unit with DSP suppresses echoes and background noise, so that unwanted sounds like paper crackling, table tapping etc. are cancelled out completely. 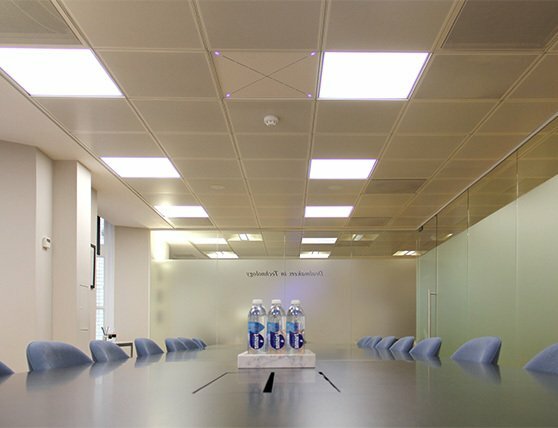 The investment bank in London also appreciates the ceiling solution for another reason. The conference room, offering 24 places around the table, has a floor which is not suitable for cable installation, so a ceiling mounted system is ideal. The solution chosen is particularly unobtrusive. Ceiling tiles were removed, and the TeamConnect Ceiling unit fitted. Four loudspeakers in the room's four corners round off the new audio combination. DaveNish: "The aesthetics of the room are fully preserved by this solution." The technology manager found the overall package offered by TeamConnect Ceiling "simply persuasive". He does admit though that he was initially a little sceptical about whether the product would actually fulfil its promise. The initial hesitation was not entirely baseless, because the system did not immediately function optimally when first installed. Luckily, TeamConnect Ceiling can be individually customised to match actual room conditions. The acoustics of the room at GP Bullhound was in fact a challenge: three of the four walls in the large conference room are glass. Another challenge was that the TeamConnect Ceiling unit didn't immediately co-operate with the Zoom video conference system installed at GP Bullhound. The reason was simple: both systems have their own noise suppression systems. "After we deactivated the noise suppression in the Zoom unit, the problem was solved," reports Dave Nish. Sennheiser UK technicians also adjusted the system more precisely to the local conditions and it has now been accepted by GP Bullhound. Nish reports: "Today everything runs smoothly." Mr. Nish also likes the solution's Plug&Play implementation. Participants simply connect their own devices (notebook, Smartphone, etc.) to the master unit and the audio or video conference can start. The suppression of background noise delivered by the Sennheiser product works very well. The noise of the air conditioning, for example, can't be heard by external participants. Dave Nish's round-up: "If we weren't happy, we'd simply return the product. But it is still here." In fact, Mr Nish has actually got another Sennheiser solution on trial at GP Bullhound offices in Stockholm: the TeamConnect Wireless conference solution. A ceiling unit was unsuitable for the office in Sweden because it is an older building with high ceilings and ornate decorations, which basically prevent any installations whatsoever. Which means that the Swedish boardroom now has four microphone and speaker satellites standing on the conference table. But there is one thing the Swedish solution has in common with the London installation: no cables.